Does A Recession Have To Mean A Bear Market? The reversal of the U.S. Treasury yield curve has predicted the past seven recessions. Global economic data deterioration adversely affects GDP growth around the world. The S&P 500 rises but EPS decreases - will the divergence between the economy and stocks widen? Several days ago, we were dealing with the reversal of the yield curve in the United States. This is a situation where the interest rate for short-term bonds is higher than in the case of long-term bonds. Last week, the yields of three-month and one-year U.S. bonds turned out to be higher than the 10-year yield. Such a phenomenon is usually treated as a signal of an impending recession. As in the case of the trade war, the media needed a specific event to inform people that a recession is on the horizon. When the yield curve started to reverse at a rapid pace, the markets suddenly became paralyzed by the fear of an upcoming recession. Meanwhile, from an investor's perspective, such information is belated and of less value. Therefore, we will take two steps forward again - we will check whether the economic data also indicates a slowdown, and we will consider whether a recession must mean there will be a bear market appearance on the trading floor. Ultimately, during these times central banks are trying to keep the market from panicking. Let's begin with the U.S. bond market. As a small reminder, most of the time bond yields are higher the longer their maturity. Ultimately, lending money for a longer period of time bears higher risk. However, this does not change the fact that, sometimes, the demand for long-term (10- or 30-year) U.S. bonds is so high that their yields drop and are lower than in the case of short-term bonds. Such a phenomenon generally means increasing fear among investors. As a result, there is a reversal of the yield curve, which can be seen on the left in the graph below. The light gray color shows the yield curve from two years ago, the dark gray one is from the last year, and the blue one is the current situation. As you can see, the latter no longer shows the growing trend (like the other two), but slowly begins to turn. In turn, on the right side of the graphic is a chart showing the difference between the interest rates of one-year and 10-year U.S. bonds. When the spread falls to zero (as it is now), it indicates an upcoming recession. 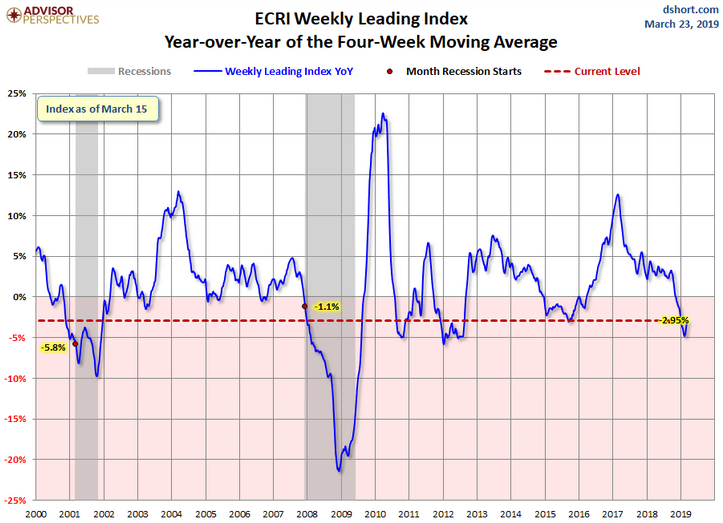 This indicator has worked well for the last seven recessions. Anyway, the details from the bond market do not have to immediately convince anyone that a recession is on its way and you must run to the safest assets. Furthermore, many analysts responsible for maintaining "good moods" have already said that "this time is different" and one should not worry about the yield curve. That means it's worth looking at other important indicators. Observation of the GDP of various countries allows us to state that we are dealing with recession. 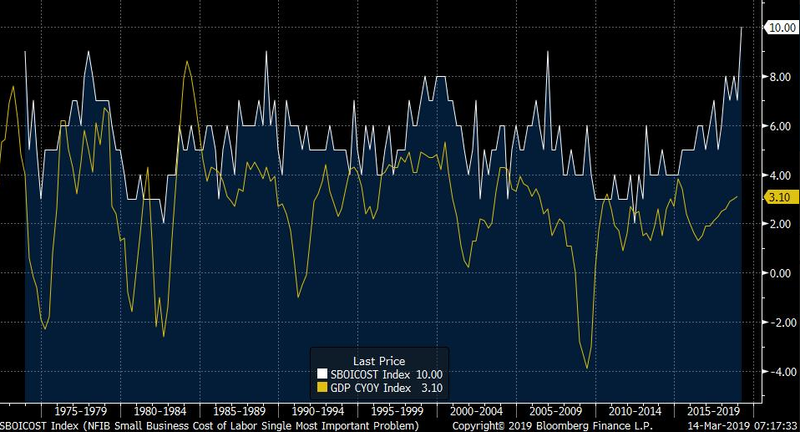 However, there is a so-called leading indicator that monitors changes in many macroeconomic data (including GDP, sales, and employment). When its value in annual terms begins to drop, it should be treated as a significant warning. Not every descent below zero means a recession, but in the current situation a glance at the graph tells us a lot. The Global Weekly Index is today almost 3% lower than last year. What will happen to the index in the coming months? Nobody will answer this question, but we can look for clues analyzing the situation in different regions of the world. Let's begin with a country that, for the last several decades, has had a huge impact on global economic growth. A lot depends on China, while the local industry shows that the country experiences lower and lower demand for their products. The PMI index looks as bad as it was at the bottom of the recession in 2009. Official figures for China still show economic growth at 6%, while statements suggesting it is 0% or 1% are immediately censored. The exports of South Korea also look dramatic. 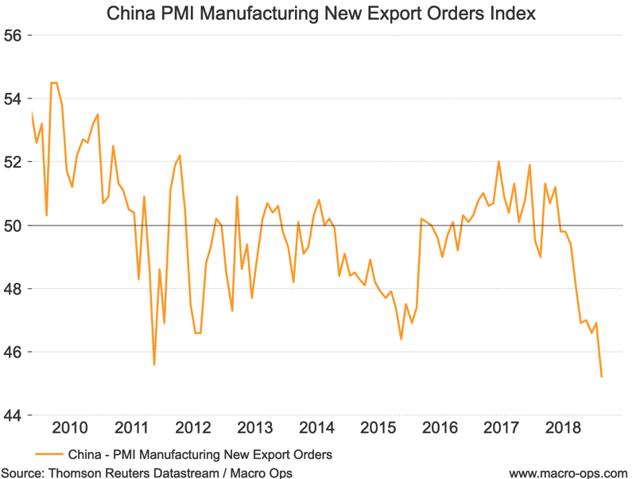 As we have just mentioned, this is an indicator that should not be disregarded because it often works as a reflection of global economic conditions (and future profits of companies). Currently, South Korean exports fall every month. In February, we saw a decrease of 11.1% year over year. Manufacturing PMI in the euro area speaks for itself. As a reminder, above 50 indicates growth and below 50 indicates the economic sector's contraction (in nominal terms, without inflation). Now, European industry is below the key level. In addition, the services PMI looks better and amounts to over 50. On the other hand, it is an indicator that reacts with a slight delay to the manufacturing PMI and generally behaves more gently (i.e., it does not adopt such extreme values as manufacturing PMI). There is nothing to be excited by in terms of the data from Italy, which has been in an economic downturn for a long time. The real problem to worry about, though, is the signals from Germany. In this case, we can already talk about entering a recession, and yet it is probably the most important economy on the continent. Germany, among others, suffers due to the deteriorating situation in the automotive sector, which is usually one of the first to be affected by weakening consumption demand. In many euro-area countries, GDP growth is below 1% per annum, while the unemployment rate is low compared to the historical data. This situation creates pressure on employers to raise wages. This, in turn, increases the cost of goods and services. Prices are rising, and consumers can't afford to spend more because of their debts. The scale of danger is also showing in the bond market. The German 10-year bond yield has dropped below zero. In other words, people are looking for a safe haven for their funds and choose government bonds, even if they guarantee loss. After the Fed resigned from regular interest rate hikes in January, there has been a slight easing in place. Again, we have seen the stock market rally, optimism has returned, and Donald Trump could once again proclaim that the American economy looks great - and would look even better if interest rate hikes had not happened before. The problem is in the U.S. economy, which shows signs of overheating. The first example is labor costs, which are measured by a special organization associated with small entrepreneurs. So far, every time that index reached around 8-10 points, a recession hit the U.S. the next year at the latest. Also, record low unemployment in the U.S. is slowly growing. In effect, the average unemployment rate for the last three months is higher than for the last six months. Over the last few decades, every such type of event has preceded a recession. 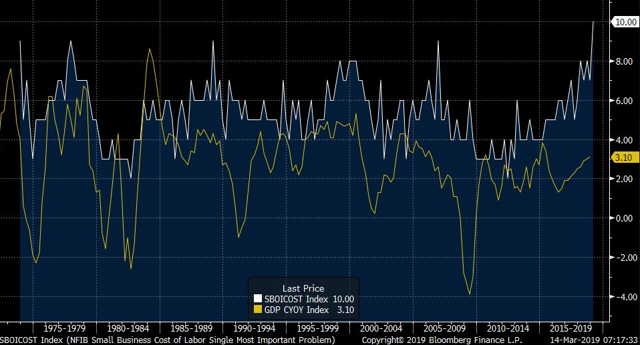 As for GDP growth in the U.S., the first quarter of 2019 will still be positive. It can, however, negatively surprise the market. Many large entities assess that GDP will be between 1.5% and 2.5%. Needless to say, GDP far below forecasts will mean hundreds of news stories about the recession and further shocks to the market. Let's not forget about the Fed statement from March: the total exclusion of any rate hikes this year, fairy tales about a rate hike next year, and premature termination of the balance sheet reduction. This means that the Federal Reserve is already preparing for the first hit of a recession, after which tools of exceptionally loose monetary policy will be automatically applied. Canadian GDP is falling very quickly. It has to be noted that in this country, a key role is played by the real estate market. The inflow of Chinese capital and speculative activities have been raising housing prices to record levels. As a result, the value of real estate and activities related to this market (e.g., construction, insurance) have started to have a huge impact on GDP. At the same time, flats and houses became too expensive for ordinary citizens, which caused considerable dissatisfaction. The protests over time have brought desired results. Vancouver and Toronto have decided to introduce special property taxes for real estate purchased by foreigners. In this way, the market was cut off from the new capital and the bubble began to burst, which now translates into worse macroeconomic data. San Francisco Case-Shiller Index increased by 121%. Montreal Bank House Price Index increased by 158%. Toronto Bank House Price Index increased by 205%. Vancouver Bank House Price Index increased by 300%. This gives us a certain point of reference regarding how dramatic effects on the Canadian economy may have created a bursting bubble in the real estate market. Another important point: After World War II, it happened that the U.S. fell into a recession, and Canada was able to avoid it. In turn, when Canada fell into a recession, the U.S. always fell into it. In summary, the situations in Europe, Canada and Asia look very poor. In case of the U.S., the worst is probably ahead of us. Does that mean a sharp drop in the stock market? We will certainly be witnessing events similar to those from March 22: stocks down, bond prices up. It is much harder to predict the scale. When central banks started purchasing shares and bonds 10 years ago, the market did not know what the effects of these actions might be. Today, thousands of investors believe that the appropriate scale of purchases has a chance to keep the assets at high levels. This is one of the factors that supports optimism in the U.S. In this way, the Fed has led to an absurd situation in which market prices completely dispersed with expected profits of the companies. This can be seen in the chart below, where the S&P 500 index is shown in green, and the profits of the companies included in the index are denoted as a red line. However, until a recession is officially confirmed, the central banks of U.S. and China have no pretext on which to introduce another QE and negative interest rates. We have to wait for their reaction. For now, two opposing forces will act on the stock market. On the one hand, the fear of a recession and information about companies' poor results will deter people from investing in shares. On the other hand, the hope of an imminent QE4 launch will cause some investors sitting on the sidelines to take advantage of the first strong rebound after the announcement of the printing. Donald Trump has a strong motivation to keep high prices on the stock exchanges. The better the situation, the more Americans will be in a good mood when approaching next year's elections. With the current involvement of central banks, it is extremely difficult to determine where the markets will be in the next three months. However, we are convinced that more bad data coming from the economy will increase volatility in the markets. Central banks will certainly try to save the situation. However, one can not rule out a scenario in which one of their interventions will be perceived by the market as a total loss of control. What will happen then? In a moderately pessimistic scenario, the stock market will be massively shaken and capital will flow to bonds. 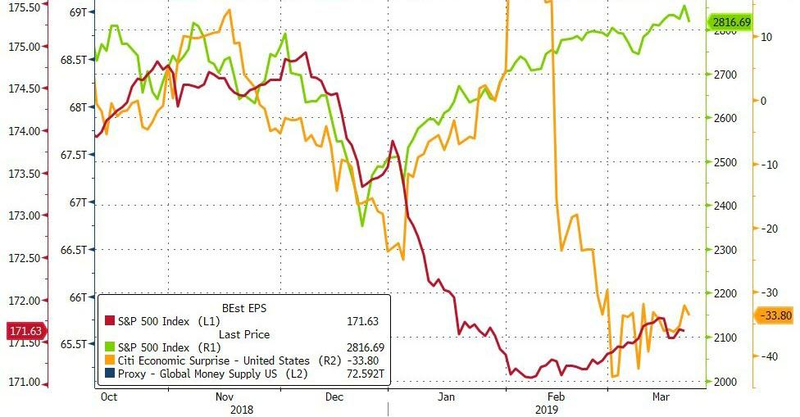 In an extremely pessimistic scenario (very low probability), capital will start to evacuate from both main markets, which could be a threat to the further functioning of the financial system. In our opinion, the most likely scenario is a printing on two fronts. On the one hand, we mean keeping high prices in the stock market to avoid panic. On the other hand, the economic recession will lead to a strong rise in unemployment. Governments will be forced to spend more on benefits, and some countries will introduce universal basic income. In the context of the markets, the result will be a repeat from the 1970s: high inflation and increases in tangible asset prices. Extremely expensive shares in the U.S. in nominal terms will fall in the sideline trend or slightly increase, but after taking inflation into account it will turn out that they were hopeless, and only bonds' performance would have been worse than them. However, before central banks officially face a recession, it is worth it to hold your funds mainly in cash. The best way to do that is in U.S. dollar and Swiss franc - i.e., safe haven currencies.